Looking for old school alpine ski resorts, sans wifi and high speed everything? Do you long for long scenic chairlift rides to untracked snow and uncrowded ski trail – no big lift corrals with RFID tracking your turns, or people texting on crowded gondolas, just wide open space and solitude? Throwback to these ski areas with the ambiance of the alpine sport in its origin. Powder Mountain in Utah is huge, 8,464 acres, and humble – mostly fixed grip lifts, with tons of hike to terrain, and limited lift ticket sales promising plenty of powder to the people, Stay tuned as the Summit Group develops this quiet ski gem in Eden Utah. Alta in Utah is authentic alpine, no snowboarders allowed, vintage lodges like the original Alta Lodge at the base, and an earthy ski clientele at lift opening every day. Bridger Bowl Montana offers fixed grip lifts, a fun family friendly vibe, and a chairlift that requires peeps to access the Ridge which is hard-core terrain. Monarch Mountain Colorado near the cool town of Salida is off the grid, awfully friendly and fun on a powder day. Silverton Colorado is retro with just one slow chair that gets you to the hike to hearty terrain. Silverton is experts only – period. Wolf Creek Colorado has old school lodges, its family owned and operated but gets a bounty of snow for the mostly local skiers here in remote southwestern Colorado. Lookout Pass in Idaho on the Montana border is right off the highway with a base lodge right out of the 70’s. Fun groomed runs are served by fixed grip lifts, with a fun welcoming vibe. 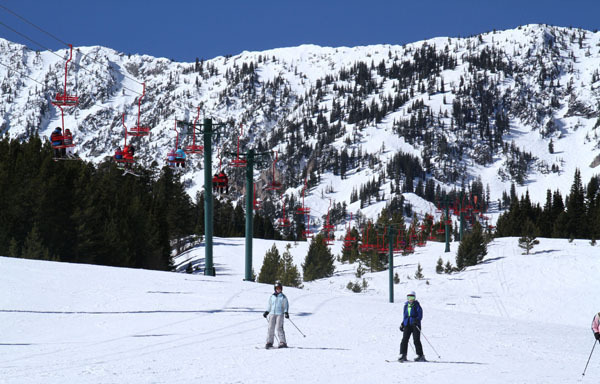 Brundage Mountain in Idaho has a rustic aframe chalet, classic lifts and good old fashioned d trail skiing. The nearby lakeside town of McCall is home to as many snowmobilers as skiers… good times. Homewood in Lake Tahoe California is old school, with sensational views of Lake Tahoe. Everyone else skis nearby Squaw, Northstar and Heavenly – which makes Homewood a haven. Stay tuned as plans for an on mountain Homewood hotel and new lifts are pending here. Black Mountain in Jackson, New Hampshire is like skiing in a museum. From the authentic chairlifts that chug up the scenic 1,100’ vertical looking out at Mt Washington, to the cozy base lodge nestled in a horse pasture, Black is a step back in time- since 1935. Mad River Glen Vermont is New England’s last vestige of skier only vertical. Not much snowmaking or fan fare here, just classic trail skiing, a single chair, and a fierce “ski it if you can” moniker to scare away the snow bunnies and snowboarders. Magic Mountain in Vermont has also missed out on the modern spell of high speed lifts. The friendly southern Vermont ski area is vintage from the slow double chairlifts to the old school authentic base lodge.